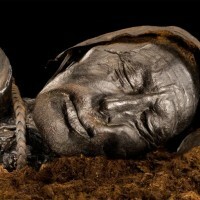 Bog bodies: Bronze and Iron Age people who (a) suffered violent deaths and (b) were intentionally interred in a peat environment that subsequently preserved them. Spectacular but strange time capsules of a lost way of life and death. Some of them are so well preserved that you can imagine them opening their eyes and speaking to you. Their very obvious humanity makes them all the more curious and, perhaps, disturbing. It is almost if we have been given the tiniest slice of ancient life and we want more; bog bodies appear to be answers, but are actually just questions. In Bog Bodies Uncovered, Aldhouse-Green starts with these questions. And adds more. And more. With each answer, more questions crop up. Every time you think you are getting close to understanding ‘the lives and deaths of an ancient people’, you find yourself more curious and further away. That isn’t a problem, that is reality. The strength of Aldhouse-Green’s books is that she doesn’t have all the answers, but she wants to think through some of the options with you. First, the obvious question: why am I reviewing a book about bog bodies on a website about culture crime? Obvious answer: because bog bodies are awesome. 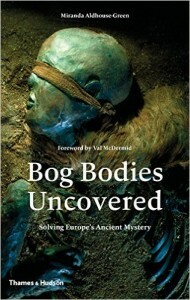 Real answer: the author of Bog Bodies Uncovered starts the book by approaching the bodies like one would a crime scene. She moves through the investigative process, employing forensics of all sorts then social analysis. As Aldhouse-Green says, these are ‘very cold cases’. Chapters 4 and 5 in particular focus on forensics: science as applied to the bog bodies. A pattern emerges of people who are ‘different’ in some way seemingly being selected for death. A man who is remarkably tall. Another with extra thumbs. A girl with a spinal problem. Etc. Then another pattern: violent deaths, some bordering on overkill. Perhaps RITUAL overkill. And then we move into the social world. Who were these people? Who killed them? Why? Side note: I’ve said this before about Thames & Hudson titles: this is a high quality book. The pages are luxuriously thick. How do they afford it? Their titles are so reasonably priced! I really like how this book feels. Reading an actual book these days should be pleasurable in itself or else why not slap it on the eReader. Bog Bodies Uncovered is worth holding. Back on track. Throughout the book the author uses extensive quotes from Roman sources, usually at the start of sections. At first I was a little iffy about this. I tend to naturally skim starting quotes or skip them entirely. If you, like me, are a quote skipper, don’t skip these: they are an important part of the author’s narrative. She uses them to construct interesting speculations about the bog bodies. The quotes bring possibilities. But this, in itself, is something I got quite hung up on. By relying so heavily on written material supplied by SERIOUSLY biased Romans who weren’t even really talking about the cultures that produced the bog bodies, is there any value in including them? Are they just more noise that we need to filter to get at whatever ‘truth’ is? Thinking it through, though, I am with Aldhouse-Green on this one. The quotes are important. She starts her book with the bodies themselves but, necessarily, moves outwards. A good investigator uses what they have and what we have are the Romans. She doesn’t use them to assert reality that we can’t possibly know; rather, she draws on Roman sources to help think through ‘what ifs’. Sure, her ‘what ifs’ don’t always match my own (I think about bog bodies quite a lot; probably more than I should admit), but that’s fine. The book is stronger for them. I love past possibility that is well argued but not presented as absolute fact. Kudos Aldhouse-Green! All in all, in Bog Bodies Uncovered, Aldhouse-Green is spinning a world that slowly expands outwards from the remarkably preserved physical objects (the bodies themselves) into the realm of the living past. The author notes that these were living people and they deserve the ‘dignity of sensitive engagement’. I think she has provided that dignity. Bog Bodies Uncovered is the bog body book that I’ve wanted for some time. Enjoy it.